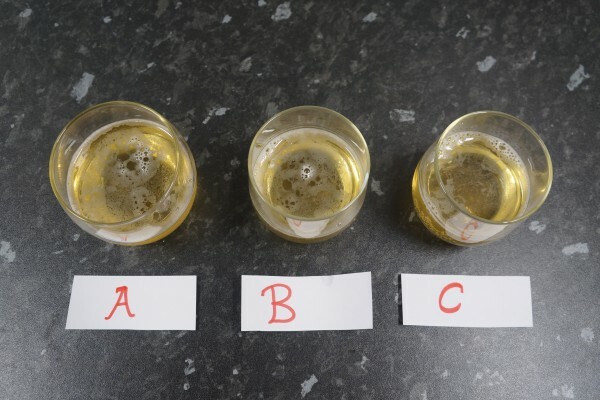 As I’m taking a break from blogging (although I will be doing some guest posts on the Grainfather site) I thought I’d hit you with a doozy, this one might take a couple of reads so should keep you going for a while :-). 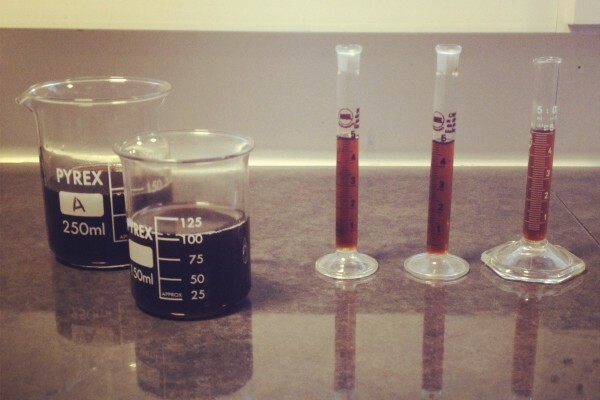 Oxidation as we all know is not beer’s friend (apart from when aerating the wort) but as homebrewers (and a lot of commercial brewers) it’s really hard to eradicate from packaged beer. You’ve slaved over a recipe, spent a fortune on ingredients and brewed up a cracking beer only to find that after three weeks in the bottle it tastes like cardboard…what can you do to mitigate this situation? The best way to avoid this is to purge all vessels with CO2 or Nitrogen, taking utmost care with oxygen pick up, ensure your bottling machine (because all home brewers have one of these right?) is purged with ample fob when filling bottles to remove oxygen….but in reality this isn’t likely to happen on a budget. Purging is a possibility but at the time of bottling this is when most oxygen will be picked up. 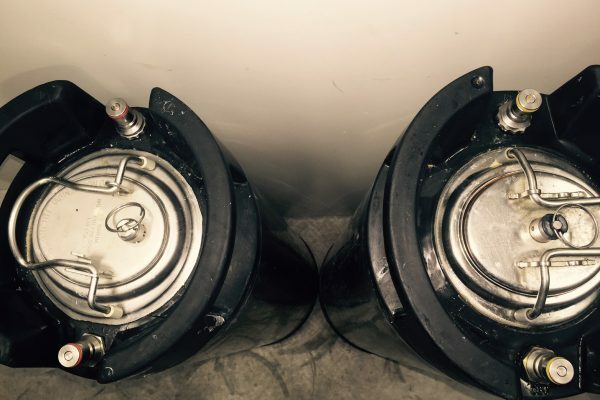 There are chemicals about that will help remove oxygen from beer but call me crazy but I’m not massively into those sorts of additions, so what to do? A great way to extend life of your beer is to just brew dark beers but that’s crazy and is that true anyway….apparently it is! See point 3 here. 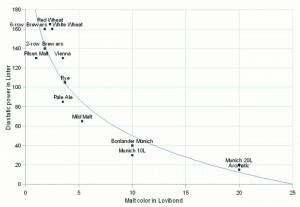 Historically, a couple of centuries ago it had been established anecdotally that darker beers had superior keeping qualities than their paler brethren, nobody really knew why that was but there was an arms race to manufacture a light coloured beer with the same storage capabilities as a dark beer. 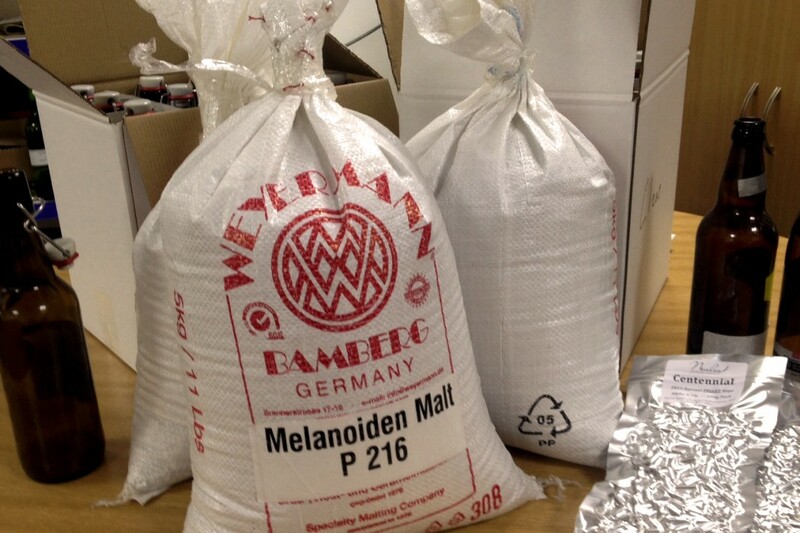 We now know why that is, as part of the malting process, turning barley into usable malt for brewers we know that compounds called melanoidins are created in a process referred to as the maillard reaction (a reaction between the reducing sugars in malt and enzymes). 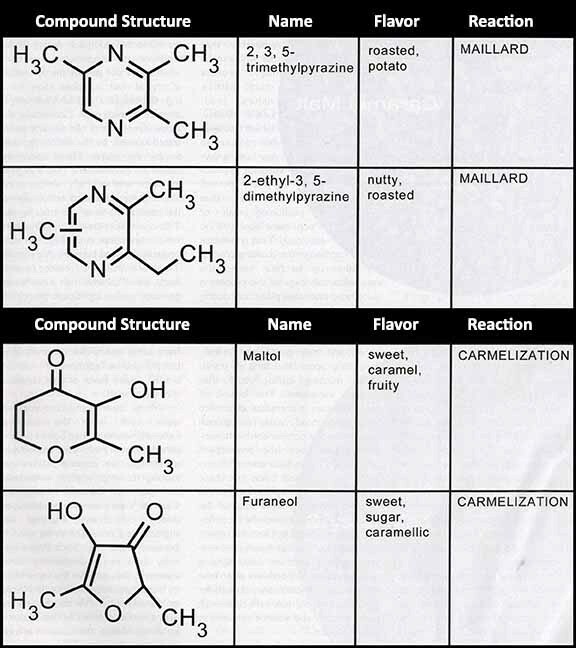 This reaction creates darker malt when kilning green malt and simultaneously happens during caramelisation (or pyrolysis) in other types of malt. 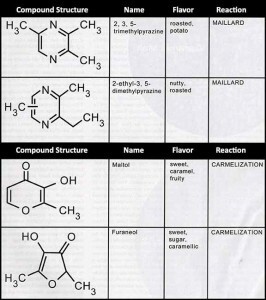 During the maillard reaction carbonyl group of the sugars react with the nucleophilic amino group of the amino acids and forms a complex mixture of molecules responsible for a range of odours and flavours, of particular interest is maltol which is a flavour enhancer. Melanoidins are useful because they not only add colour and flavour to beer they also protect against oxidation. Back to the arms race, in regions now known as the Czech Republic, the quality of coal was poor; this was generally referred to as brown coal. Brown coal contains high levels of sulphur which oxidises to sulphur dioxide (SO2) when burnt. SO2 has strong bleaching properties. By permeating through the malt along with the other flue gases from the direct fired kilns of the day, it would “bleach” the malt to a paler colour. 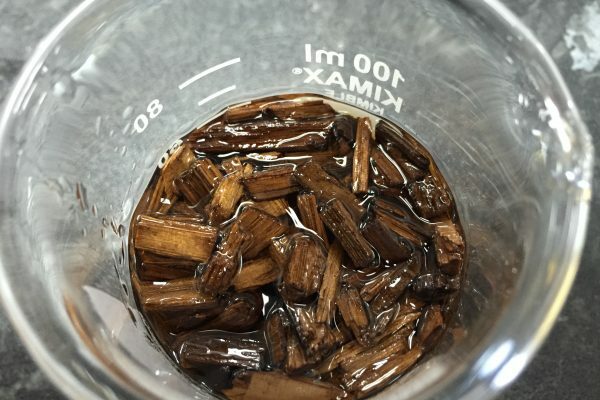 The result was that melanoidins would still be formed from the normal curing regimes of the day, but the malt would be bleached concomitantly. 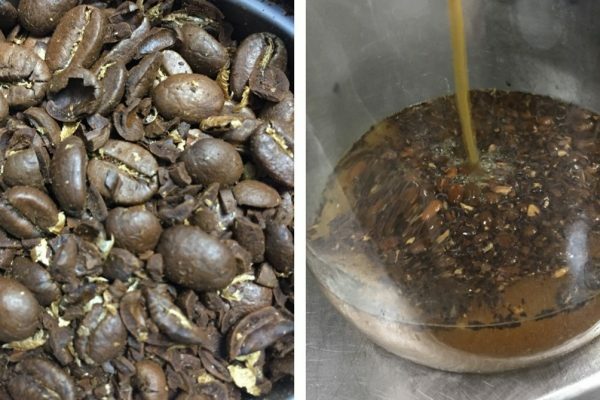 How to utilize this fascinating information in brewing? The easiest way like I’ve said is brew dark beers but that’s crazy, how about using caramalts and crystal malts in your beers? 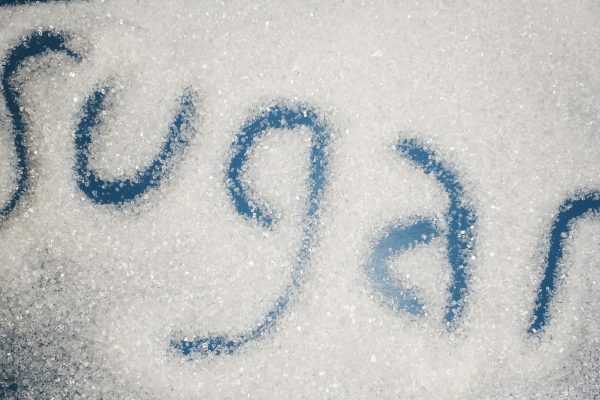 Are you crazy I hear you say, we can’t use crystal or caramalts in US style IPA’s that would make them far to drinkable and stop them being fizzy hop water …WE NEED TO USE BASE MALT ONLY! Ok, far be it for me to decide how you design your malt bill or what you should drink, what you need is a diastatic malt that has melanoidins to preserve shelf life, what often gets over looked in recipe design is the use of other diastatic malts that are not just ale or lager malt AND contain maillard reaction products. These are called coloured malts or Hi-dried, they go through the same process as ale or lager malts which is steep, germinate and then kiln but the green malt is dried at lower temperatures than base malt but then kilned at higher temperatures than base malt, the drying process allows the survival of the required enzymes. Good examples of these are, Vienna, Munich 10L and 20L, Mild malt etc. My theory then is that if you wish to remove any caramalts from your grain bill but wish to extend the shelf life (without using sulphur dioxide) using proportions of hi-dried malts may help you achieve that. Figure 2. 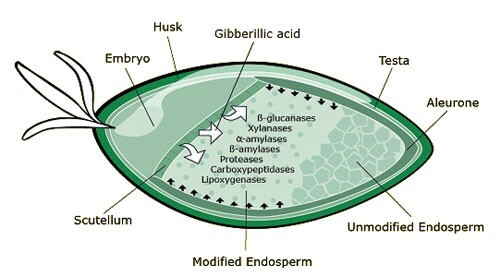 Barley Kernel – different enzymes and processes. My theory then is that if you wish to remove any caramalts from your grain bill but wish to extend the shelf life (without using sulphur dioxide) using proportions of hi-dried malts may help you achieve that. Caution must be taken though, there is a trade-off, although the hi-dried malt contains enzymes they are often at a lower level because of the more intense kilning. Diastatic power is a measurement in degrees Lintner and gives a ratio for all amylases present, a range between 35-160 degrees Lintner is a normal range with alpha amylase range of 30-60 dextrinising units being ideal depending on the malt and the mash used. Dark Munich has as little as 10 dextrinising units. So using hi-dried malts may mean sacrificing some diastatic power although this usually depends on the colour of the malt, the darker the malt the less enzymatic potential but my suggestion is to use proportions of different hi dried malts in unison with other malts that have the potential to make up for the shortfall in diastatic power. I did flirt with idea previously when brewing commercially, the wild boar malt bill utilizes lager, Munich and Vienna malts although I never quantified the effect on shelf life. I’ll be testing this theory and what affects these malts have on shelf life and flavour and aroma. I will post the results on here in the coming months, however as I mentioned at the top I won’t be posting on here very frequently going forward but you can still get me on twitter @Port_66 or @kempicus or by emailing askjk@port66.co.uk for the time being.